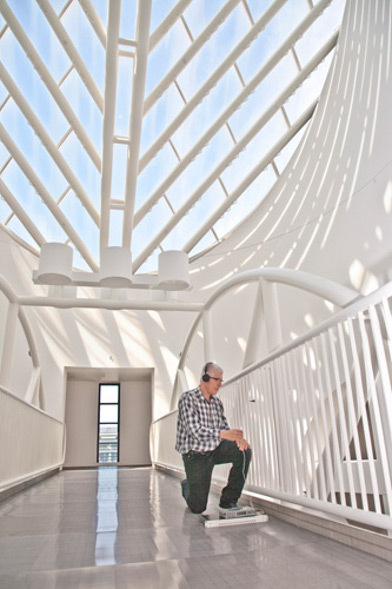 The January 2011 edition of the San Francisco Museum of Modern Art’s “artcast” (née podcast) includes a sequence on Bill Fontana, the sound artist. At the 10:40 point, he talks about “Sonic Shadows,” his installation that is currently running at the museum. The work involves reactive triggers on the SFMOMA’s famed bridge, which runs atop its vertiginous atrium. However, the sounds that one hears are not entirely from the visible portion of the site. Instead, they are drawn from various places, many of them beyond the public’s mental image of the museum, such as deep in its boiler room. Fontana explains that “all the sounds you are hearing are actually happening,” though he allows there is a bit of “alchemy involved” (MP3). There’s also an M4A version of the artcast that includes embedded images related to the various segments. More on Fontana’s bridge-work at sfmoma.org (from which the above photo, by Don Ross, is borrowed). “Sonic Shadows” is scheduled to run from November 20, 2010, through October 16, 2011. If you’re in San Francisco this Thursday, February 3, there’s a lecture scheduled on the Fontana work at 6:30pm: sfmoma.org. Note: As of today, the Disquiet.com Downstream section will run new material seven days a week. Previously it was updated on weekdays (Monday through Friday). This is a small but needed upgrade. There’s simply too much free music on the web, compared with seven years ago, when the section first launched. So-called “free” culture has developed into such a rich community (really a community of communities) that what was once a hunt for good material is, today, more a matter of finding the best needles in a needle-packed haystack. Part of the reason for the expansion of the Disquiet Downstream section is to allow me to deal with sheer volume of music that’s of interest. Part of it is make me feel more comfortable mentioning a given individual act more frequently than I might have in the past, now that there are approximately 104 more slots per year for Downstream entries. After the launch of the Disquiet.com Downstream section, in October 2003, its goal shaped into the following: recommendations each weekday of legally freely downloadable audio (usually music, though occasionally a related lecture, documentary, or interview segment). The Downstream entries are almost always MP3s, though alternate sound sources (Ogg, Flac) appear if they’re the only ones available. As a sign of how the section has developed, the very first Downstream entry wasn’t even for an MP3 at all, but for a video (for a song by Luke Vibert). 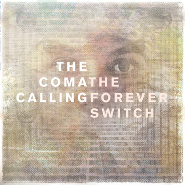 So, for Sunday enjoyment, a bit of self-styled glitchy folktronica: the four-track set The Forever Switch by the Coma Calling. Perhaps the key track is “Lying Amongst the Blooms,” which has at its base a heartbeat rhythm and a gated bit of muffled noir-movie drama, a rising muted-orchestra sample that cuts off suddenly, only to repeat again. The method isn’t uncommon, but it remains highly effective. It serves two purposes that contrast strikingly with each other. The tone itself is lush and nostalgic, even if it sounds like the audio is being filtered through layers of walls and muslin. But the cut is harsh, turning lush into beat. The lush/beat is soon paved over with enough rhythmic material, not to mention an ’80s-style thumbed bass break, that the contrast loses its impact. Almost the whole album pushes past digital tomfoolery toward instrumental pop. Opening track “The Jenny Louise Bell Set” seems to employ a little kid’s xylophone, heard against threating winds right out of a radio adaptation of an Edgar Allan Poe story, and again giving way to a richly rhythmic and vocal-less song. Ditto “Poems,” which like those two other tracks eventually layers in a blippy robot-melodic riff, rendering the opening tonal material to background status. Great stuff all around, though you can’t help but miss the simplicity of how each track started off. “Arc” is the one piece that doesn’t lose sight of its origins, but is comfortable to take that material — a loungey, wavering spaciness, like Angelo Badalamenti gone shoegazing — through to the end. Perhaps tellingly, though, it’s the shortest track of the four. The tracks are at thecomacalling.bandcamp.com. The Coma Calling is Kyle Cramb, homepage at thecomacalling.com. Other 2001 Resolutions: More steaming-only music coverage. 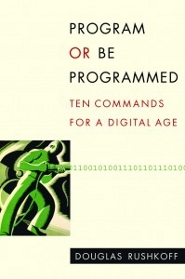 The title of Douglas Rushkoff‘s recent book, Program or Be Programmed: Ten Commands for a Digital Age, is in essence — true to all such high-concept titles — a cheat sheet for the full text. Spend more than a minute pondering the four words that precede its colon, and you pretty much know what’s coming: Today we live in a world that is increasingly mediated by digital technology; people who fail to educate themselves about how that technology is controlled risk leaving themselves open to manipulation — i.e., to being controlled. As for those “commands” to the right of the colon, they provide the book’s structure, a coy nod to the Ten Commandments. Rushkoff’s isn’t really comparing himself to Moses. He’s comparing himself to, or acting as, a Talmudic-style scholar. He’s explaining how the written word shapes, informs, and provides a means to understand human existence. In this case, the written word is the hand-typed code that is the programmed back-end of digital technology. I wrote the piece, “10 Things Musicians Can Learn from Douglas Rushkoff’s Program or Be Programmed,” for weallmakemusic.com. It was published earlier today. While Egypt is seized by historic disruption and protest, thoughts turn to what has been disrupted, what culture is on hold. 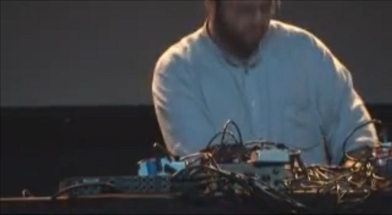 The websites of two instrumental contemporary electronic musicians, Hassan Khan (at hassankhan.com) and Mahmoud Refat (at 100copies.com), are currently not quite offline, but not quite online, either. This may entirely be a coincidence (I hadn’t been on either site recently), but as of this morning, the Khan has been reduced to a holding page, and the links on Refat go to a server error. At times, the Refat doesn’t load at all. Web searches that lead to deeper pages on the Khan site have partial yields (such as one for his excellent 2002 album Tabla Dubb, though its embedded MP3 URLs, which direct to cairobus.com, are no longer functioning). Fortunately, there are numerous YouTube videos and, at archive.org, an hour-long set in Berlin by Khan (pictured above) from January 2008 (MP3). The set seems to have been given the title “Incidence.” The concert was held by the organization salonbruit.org. For tonight’s evening Khan presents a seamless continuous mixture of older and newer music pieces including: lust, figure and ground, KOMPRESSOR (music based on translating sets of dreams), lamptone, G.R.A.H.A.M., beautiful music and host. The Pieces are accompanied by different video sequences specially shot by the artist (a monochorome Red that slowly shifts color, vertiginous dream-like tracking/crane shots of solitary public lamps at night, a portrait of a photographer, a Lynchian moment where a desk lamp is transformed into something else etc..). More on the performance, which dates from January 25, 2008, at archive.org. Also playing at the event were Tron Lennon and Tetsuya Hori. Earlier today, on the Disquiet pages at the two social networks that have become part of the story of the political uprising (twitter.com/disquiet and facebook.com/disquiet.fb), I shared some links to related music, including a video of Khan playing from 2009 (from which the above still image is taken) and a track off Refat’s album The Physical Volume, which dates from 2006. (It’s a small world. Refat’s music has appeared on several albums alongside that of Zimoun, whose concert in San Francisco was covered here earlier this week.) I’ll likely do more of the same as the situation in Egypt unfolds.